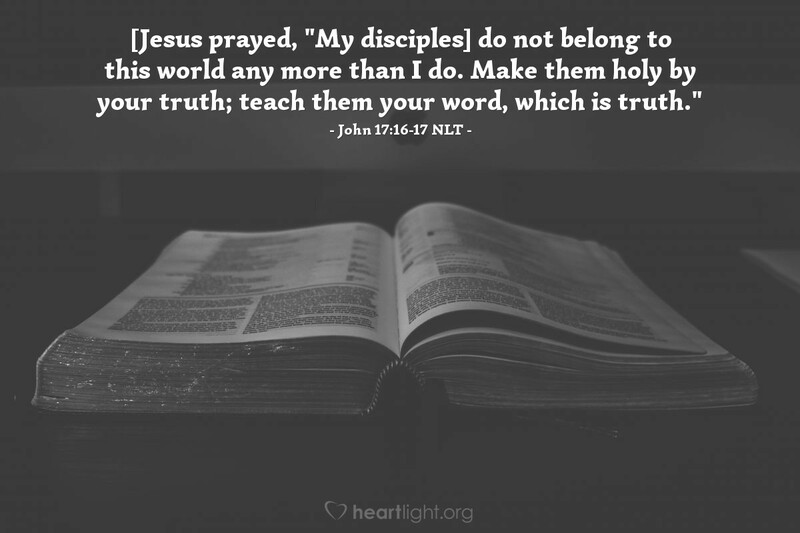 [Jesus prayed, "My disciples] do not belong to this world any more than I do. Make them holy by your truth; teach them your word, which is truth." God's word is truth. His goal in giving us his word, his truth, is not to limit us or restrict us, but to make us pure and holy. We live in the center of God's intention when we open our hearts to his word and apply that word to our lives through obedience. God's Spirit is at work to transform us into people who are pure and holy — people who are more and more like Jesus. Holy God, my loving Father, mold me to be more and more what you want me to be as I open my heart to your truth and ask that your Spirit transform my will, my actions, and my character. In Jesus' name, I pray. Amen.